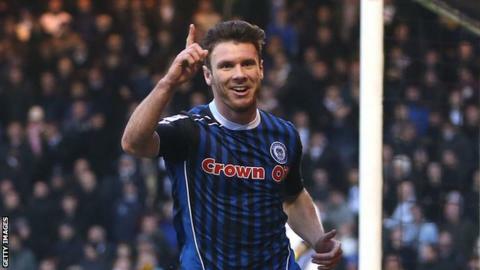 Manager Keith Hill says the return of 19-goal top scorer Scott Hogan is a "big boost" for Rochdale as they look to seal promotion from League Two. Hogan suffered a knee injury against Bury at the start of March. The 21-year-old missed a month but returned to action as a substitute during Saturday's 0-0 draw with York. "It's a big boost for the football club and for the players on the pitch. I'm happy and Scotty's happy," Hill, 44, told BBC Radio Manchester. Dale are top of League Two with 75 points, seven more than Fleetwood in fourth. "We've got five games remaining and five games to secure, for me, six points," added Hill. "I think 81 points gets you promoted. "I think everybody within the league's hoping we'll trip ourselves up, but I don't expect us to trip ourselves up, and I don't expect all those teams to win all of their games."